The Bayelsa State Governor, Hon. Henry Seriake Dickson, has signed the Certificate of Occupancy for the construction of the Brass Fertilizer Company. The Executive Vice Chairman of the Brass Fertilizer and Petrochemical Company Ltd, Chief Ben Okoye, who received certificate of behalf of the company said that the plant would generate 20,000 jobs when it comes up stream. 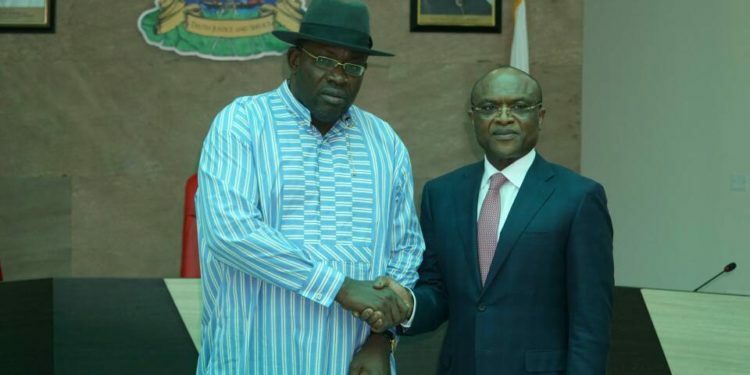 Okoye whose firm was given two years of suspended taxation by Governor Dickson said that the Fertilizer plant would accommodate a Methanol, Urea Ammonia, Gas Processing Plants as well as a 35-kilometre Pipeline Project. A Government House Press stated by the Chief Press Secretary, Mr. Francis Agbo, described the 3.6 billion Dollars plant as the single biggest private sector company in Africa with a one billion dollar equity fund in the kitty. Okoye canvassed the total support and cooperation of the Government towards the realization of the project which he said, had the capacity to transform the state’s economy and indeed that of the country. In his remarks, Governor Dickson who promised total support to the management through the creation a conducive atmosphere for business growth , announced a two-year Holliday for the firm. The Governor Governor restated his call on the Federal Government, the Nigerian National Petroleum Corporation, NNPC and other investing partners to urgently bring the Brass Liquefied Natural Gas project on stream. His words, “We are delighted having you here and we appreciate all the efforts you have been making to raise money to fund this very ambitious project. I thank you for your continued interest in our state and for foreseeing what a number of people have not seen, which is that, Bayelsa is Nigeria’s best kept investment secret. “On behalf of the Government, we assure you of our continued support, in terms of providing a conducive operating environment, which is what I’ve just demonstrated with the signing and presentation of the Certificate of Occupancy over the land you are interested in using to start up this all-important project. “To further encourage you, I’ve also directed a waiver of all fees for two years so that in the next one or two years, when the project must have started, you will then pay up all fees to the last kobo. We want you to put that money into the project and get it started,” the Governor stressed. The Executive Vice Chairman of the firm, Okoye, was accompanied by a former Minister of Information, Mr. Frank Nweke Jnr and others.